Set aside the “pineapple doesn’t belong in pizza” argument because there’s a new flavor in town that has a flavor profile that blows off the roof of any house. The province of Guimaras is very famous for their mangoes. Every year they even have a festival dedicated for this fruit which is why it isn’t a surprise that the locals has even incorporated this fruit into pizza, a dish that all Filipinos love. Guimaras province created Mango Pizza. Yes, it is true. Initially, you might say “What?! No way!” but hold on! It has come as a surprise to many ‘non-believers’ of the mango on pizza that it actually tastes better than it sounds. Many have been proven wrong about it. The different flavors within the pizza plus the different textures that mix into one another make this a local favorite. Plus, it’s pretty easy to make. Try it out for yourself by learning the recipe of Mango Pizza below. Line baking tray with parchment paper, then place Pizza dough. Spread pizza sauce over the crust, then top it with mango slices. Sprinkle Cheddar and Mozzarella Cheese. Top it with green bell pepper and sprinkle with Cashew nuts. Bake at 400° for 25-30 minutes or until crust is lightly browned. 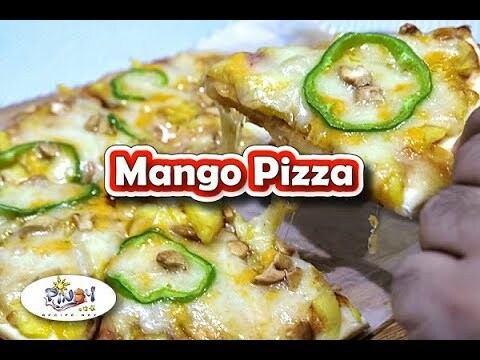 Mango Pizza Recipe is pretty easy to make, try it out for yourself!